This week Roadtrip-'62 ™ will do something different. Instead of a single highway, I’ll take a brief look at a trio of US-numbered routes. The remaining odd-numbered routes in New England all begin at the Canadian border and travel south as far as they can before hitting the Atlantic Ocean coast. They vary in length because the farther west you are, the farther it is to the coast. Route US-5 runs from Derby Line, Vermont, at the Canadian border, to New Haven, Connecticut. It's a short route, 300 miles, traversing only three states: Connecticut, Massachusetts, and Vermont. US-5 stays very close to the Connecticut River for most of its route. Highway US-7 originally ran from the Canadian border south through Vermont and Massachusetts, and ended at Norwalk, Connecticut, on Long Island Sound. Today, it traverses 308 miles because the north end was shortened by about 4 miles by the I-89 freeway in the 1970s, so that US-7 no longer reaches the Canadian border. Finally, US-9 runs 492 miles from Champlain, New York to Laurel, Delaware, passing right through New York City. It is one of only two US-numbered highways with a ferry connection. You have to take a ferry across Delaware Bay between Cape May, New Jersey and Lewes, Delaware to complete the route. In 1962, US-9 ended in Cape May as the ferry service was not opened until 1964. The ferry and travel in Lewes makes the route about 29 miles longer today. It also used to continue to the Canadian border, but now ends at an I-87 freeway interchange about a mile south. As US-5 begins up near the Vermont-Quebec border, you might have a chance of seeing North America’s version of the Loch Ness Monster, Memphre. Reports of danger in Lake Memphremagog date back to at least the 18th century, when Native Americans warned Europeans of swimming in the lake. The mysterious creature has officially been named Memphre, and has supposedly been spotted more than 200 times over the years. It’s more often seen in the town of Magog, on the Quebec, Canada side of the lake, where they have even named a café in town. The lake lies in both Quebec and Vermont and is mostly in Quebec, though most of the watershed that feeds the lake is located in Vermont. Its maximum recorded depth is 351 feet, making it the third deepest in Vermont. The 45th parallel lies halfway between the North Pole and the Equator and the idea that strange things happen along the 45th parallel is a common refrain among bigfoot and UFO hunters. Memphre is a long-necked lake monster much like the Loch Ness Monster. If it exists, it may be related to Champ, a similar monster reported to live in nearby Lake Champlain, between New York, Vermont and Quebec. Regardless of whether you see Memphre, if you visit in the fall you will see gorgeous color with the nearby hills backing up the lake. As I mentioned above, US-5 stays very close to the Connecticut River for most of its route. It crosses our US-6 roadtrip at East Hartford, Connecticut. At this point it also crosses the Connecticut River from East Hartford to Hartford on the Charter Oak Bridge. The original four-lane bridge at this point was opened in 1942. We could have crossed it in 1962, but the bridge was demolished and replaced by dual structures in 1991. We would have needed to pay a toll in 1962, but the new bridge is free. The old Charter Oak Bridge was the longest steel-plate girder bridge in the world when new. It was lucky it had such a long life, as it was supported by just two parallel girders, meaning a failure of either one would have closed the whole bridge. The new bridge has redundancy built in with multiple girders. All that remains of the old bridge are its four decorative iron medallions, which were placed on the new US-5 bridge. You can see a couple of these in this old postcard view. About a half hour south of Burlington, Vermont, in the tiny town of Ferrisburg, a trip on US-7 finds find what Vermont is all about, maple syrup. Our stop is the Original Dakin Farm Maple Market, which has been here since 1960 when Sam Cutting III bought a farm that had been around since 1792. His small roadside stand has blossomed into much larger store and an internet business, so you can enjoy maple syrup products shipped right to your door. But we’ll stop into the store at the Dakin Farm. Besides maple syrup and other maple goodies, the store also sells corn cob smoked hams and bacon, made in their own smokehouse. And they have cheeses from Cabot Creamery, which has been in business since 1919. 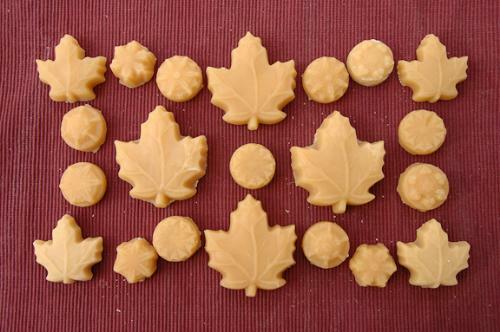 My favorite maple treat is maple cream candies, made by boiling down Pure Vermont Maple Syrup to a creamy, crystallized consistency, then pouring it in candy molds just before it sets up. You can always find it in maple leaf shape, large and small, but sometimes in other shapes like acorns, shells, other leaves, or hearts just for the fun of it. My brothers and I would argue about who got which shapes when we used to take roadtrips around 1962. Farther south, at Arlington, Vermont, you can visit the Norman Rockwell Museum. The museum holds a chronological display of more than 2,500 pieces of Rockwell’s are, including magazine covers, advertisements, paintings, and other published works. Norman Rockwell lived and worked in Arlington from 1939 to 1953. 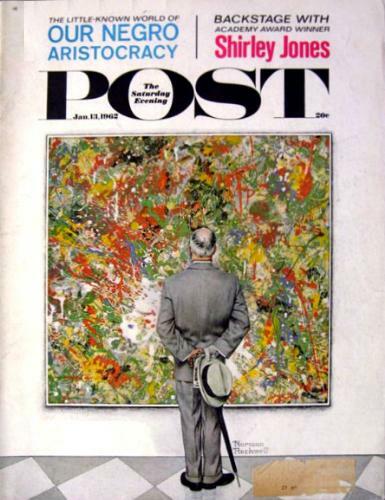 Though the museum was only established in 1976, we would have seen his art in 1962 in such places as this cover of the Saturday Evening Post. Even farther south, US-7 crosses our US-6 journey at Danbury, Connecticut. Very little of the route has been replaced by freeways, so you can make a good, old-fashioned roadtrip of US-7. The north end of US-7 was originally outside Highgate Springs, Vermont, at the Canada border. However, the northernmost segment was paved over when the I-89 freeway was built, so US-7 now ends at the northernmost interchange on I-89. In the 1940s, US-9, US-11, and US-2 all ended at the same border crossing in Rouses Point, New York! That was sorted out before 1962. Highway US-9 begins near Lake Champlain and travels along its westside while US-7 travels the east side. Then, US-9 closely follows the Hudson River for much of its length. From Albany, New York south to Fort Lee, New Jersey, US-9 in on the east bank while US-9W is on the west bank. Both cross our US-6 roadtrip near Peekskill, New York. The route has some strange route signs in northeast New Jersey and a small section of southern New York. Instead of posting normal US-1 and US-9 signs, “US 1 – 9” signs are used. The highway is known locally as "one and nine" or "one-nine". In another oddity is that the Delaware portion is signed east-west instead of the north-south signing used by the rest of the route. Along the Hudson River portion are many historic homes, such as Sunnyside, at Tarrytown, New York. Sunnyside was the home of early American author Washington Irving, best known for his short stories "Rip Van Winkle" and "The Legend of Sleepy Hollow”, both published around 1820. The house was designated a National Historic Landmark in 1962 and is now operated as a museum by Historic Hudson Valley. It contains many of Irving's original furnishings and accessories, especially in his writer's study. The guides are dressed elegantly in hoop skirts or formal dress clothes of Irving’s times. Another of the historic homes is the Home of Franklin D. Roosevelt National Historic Site. This site preserves the former President’s Springwood estate in Hyde Park, New York. Franklin D. Roosevelt was born here on the family estate and when he married Eleanor Roosevelt in 1905, they moved in with his mother. Franklin and his mother made a final enlargement and remodeling of the house in 1915 to accommodate his growing family (five children) and his needs to entertain political associates. During his presidency, from 1933 until his death in 1945, Franklin made almost 200 visits to Springwood. He also built and visited a smaller home of his own on the estate, Top Cottage, to be separate from his mother. As President, the main estate functioned as a "Summer White House" where the President hosted political associates and other prominent national and international figures. In 1943, before he died, Roosevelt donated the estate to the American people under the condition that his family would maintain a lifetime right to use the property. After he died, the family relinquished their rights and the estate was transferred to the US Department of the Interior. The National Park Service has maintained it as a National Historic Site open to the public since then. Franklin D. Rooselvelt is buried near the sundial in the Rose Garden and his wife Eleanor was buried at his side after her death in 1962. John D. Rockefeller, the businessman who built the Standard Oil Company into a monopoly by 1911, also had a home along the Hudson River. The home, Kykuit, was mostly conceived by his son John D. Rockefeller, Jr. It has been home to four generations of the family and was designated a National Historic Landmark in 1976. Though now open for tours, it would not have been in 1962. Even today, the estate is the site of about ten homes for various Rockefeller families. But US-9 has another Rockefeller property that we could have visited in 1962! Though it’s not Christmas, US-9 has a Christmas connection: the Rockefeller Center Christmas Tree. 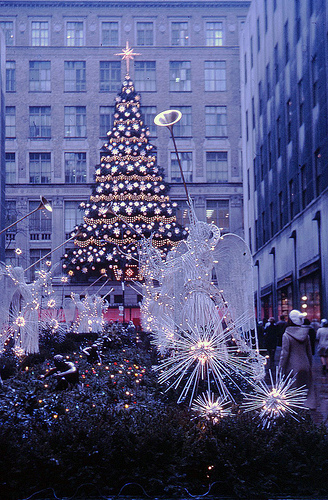 Every year since 1933 a giant tree has been erected in Rockefeller Center in New York City. And although US-9 does not pass by the tree, it does come within 5 miles of it, which is within the Roadtrip-'62 ™ distance limit for tourist attractions! It would make a great stop either today or in 1962 if we were traveling US-9. The Rockefeller Center Christmas tree is usually a Norway Spruce, which have a full shape that looks great in big trees, though it has also been a white spruce. And big it is: usually over 65 feet tall and sometimes up to 100 feet! For 2013, it was a 76-foot-tall Norway Spruce. The oldest useable photo I found shows a focus on the design of the decorations, whereas more recent years have seen the tree as a blaze of lights. The angels shown here were also used in 2013. The tree sits right in front of the ice skating rink, so we could stay awhile and enjoy that too. Now I can’t wait for Christmas: maybe I’ll get some maple candies in my stocking!